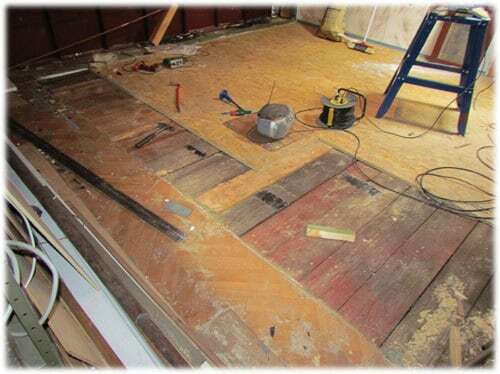 26th May 2013 – I’ve just removed the last bits of the floor today. In the afternoon, I started sorting out the old workshop with hundreds of boxes with bolts, nails and other pieces I’ve never seen before…. 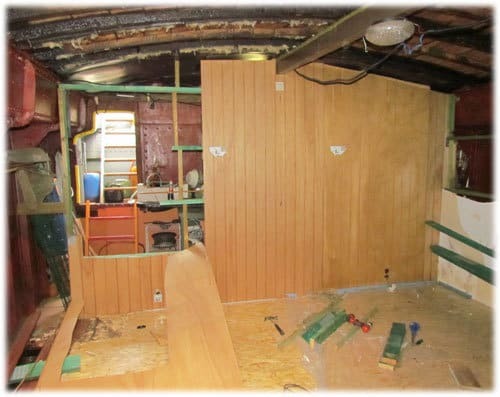 25th May 2013 – I’ve cut of the remaining framework of the walls and sorted out the wood. I drove twice with my overloaded van to a local recycling place. 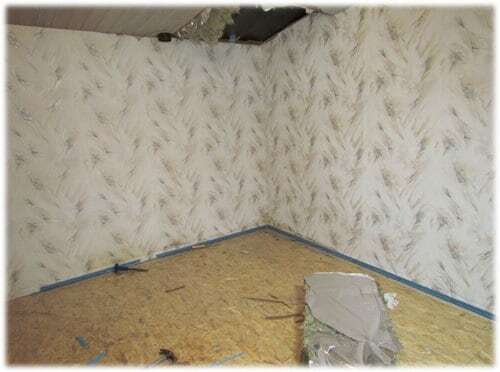 All the wood and insulation is gone. The boat feels bigger. I don’t think I can handle a third day. 24th May 2013 – Three days of work ahead. A lot of plans. 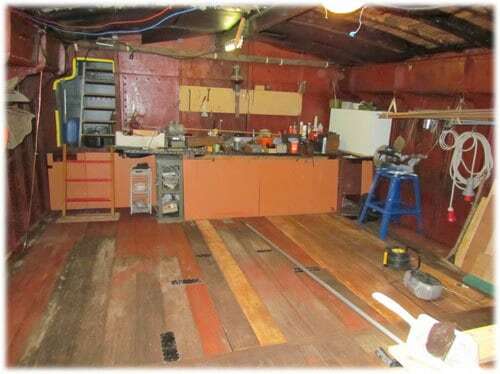 I want to clean out the engine room and the break down the big bedroom to extend my workshop. It is cold and a lot of rain keeps me away from doing an outside job. 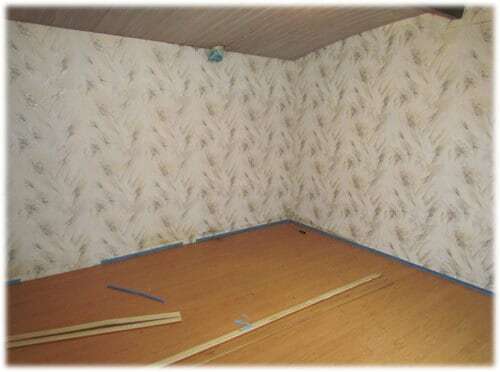 Therefore I started with the bedroom. The construction exists of layers, many layers. 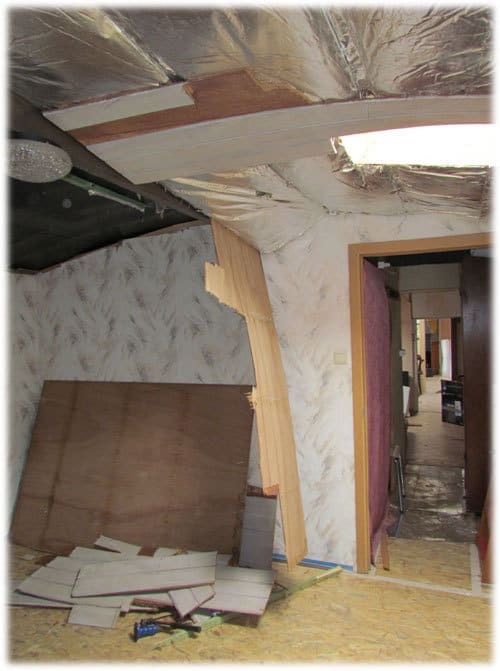 There was laminate, insulation, plastic, chipboard, rubber, linoleum and then the wooden cargo floor. The walls were no different. 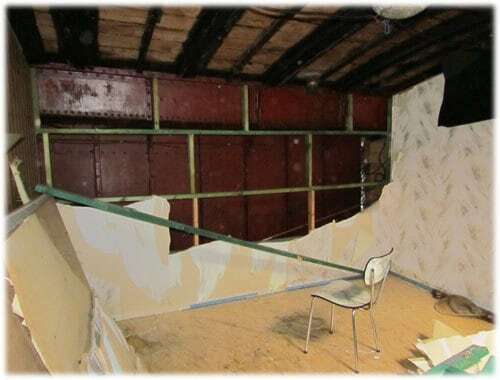 The ceiling was the hardest bit. They used more nails then there were rivets in the whole boat. By the end of the evening, the most of the room was gone, still one part of the floor was there. 18th May 2013 –It took some time to start the engine. While undoing the ropes a few nice historical barges and tugs came by for the event Oostende voor Anker. They all thought I would join them. After the second turning on the canal they were to far ahead and our engine was steaming again. Slowly, without having to stop, we managed to get to Beernem three hours later. Mission accomplished! Recently I got two pictures from Peter van de Haar when we were sailing the ship towards Beernem. 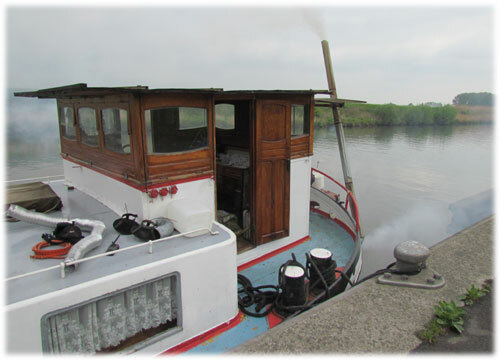 16th May 2013 – I quickly drove to Aalter to check the boat. When I arrived, two fire brigade trucks and the police were at the water side. I thought for the worse, but there was an issue in the factory next to the boat. A friend came and we chatted for a while. Tomorrow we do the remaining part of the journey. 15th May 2013 – The engine didn’t start. Their is an air lock in the circuit and we had to bleed the pipes to the injectors. We turned the boat round on the mooring and left Merelbeke. 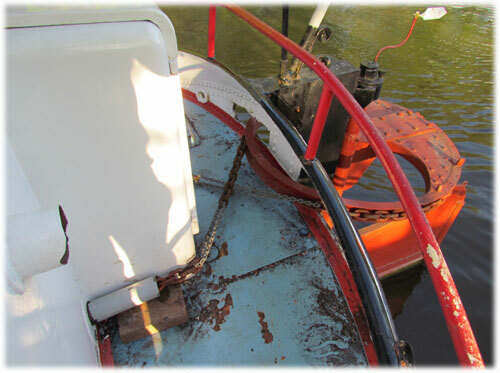 On the ringvaart we broke down three times, every time it was cooling or a broken belt. 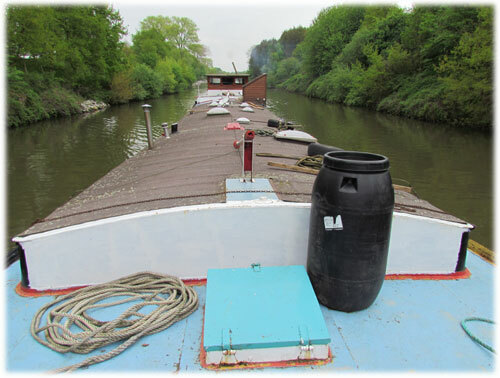 The last failure caused us to get stuck on the side of the canal…. A Dutch skipper helped us out of this miserable situation. 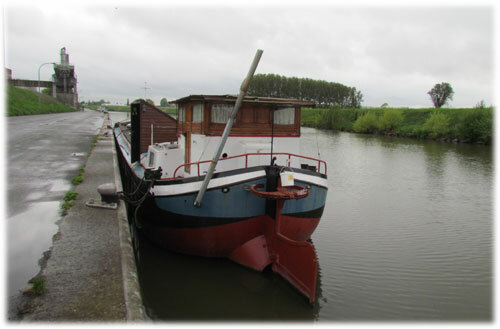 He towed us to Evergem, from where we continued our journey. 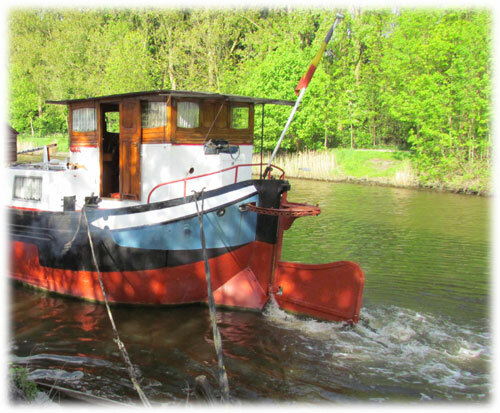 In Aalter, we moored the ship and went home. Enough for one day! 14th May 2013 – Weather is no good, to much wind. This means we are not leaving tomorrow. I did go to see the boat, check everything and charged the batteries a little more. While I was there, I fixed a few more issues that could become more of problem during the journey. People told me the boat is stuck in the mud. I had a similar feeling, but this is not true. By undoing some more ropes, she moved forward and in reverse by hand! 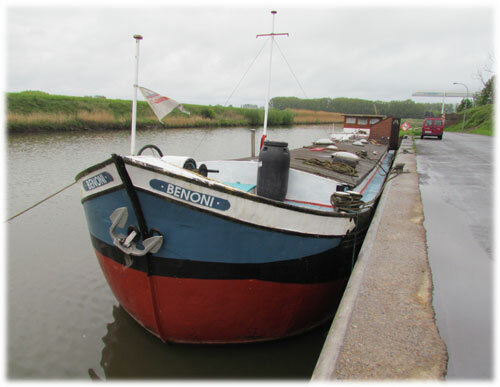 12th May 2013 – There are plenty of ropes to hold the boat in position. To win some time, I removed some ropes. They are all moldy. 11th May 2013 – I’ve mainly concentrated on fixing the issues discovered last Thursday and preparing everything for the journey on Wednesday. The steering is changed. It is now longer allowed to have a contra steering (also called in Dutch ‘Engels stuurwerk / English steering’). 7th May 2013 – The Watergeus has plenty of fuel left from the last journey. I brought ten empty Jerry cans and filled them up. 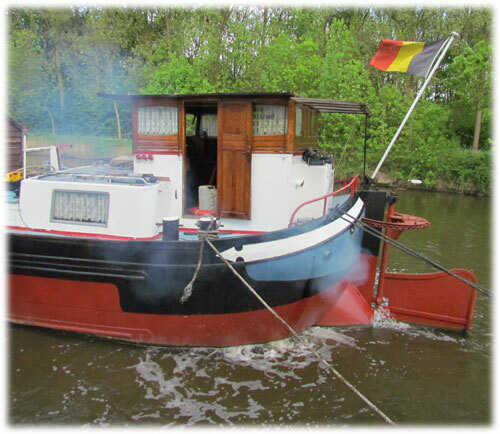 Together with start pilot and batteries, I drove to Ghent to unload it on the boat. I think I will need around 150 liters for a six hour journey. I’ll try to take double to be sure. 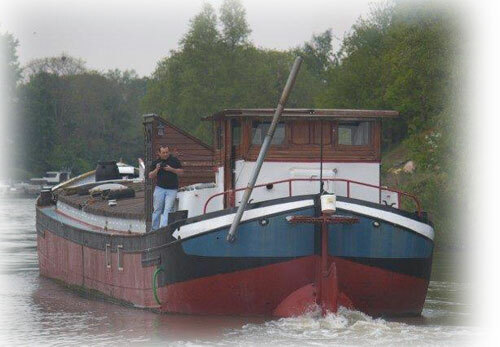 I don’t want to call a tug…. 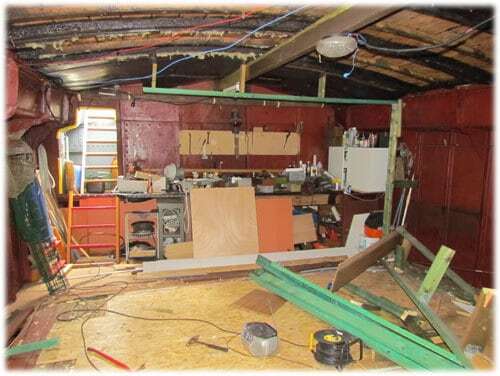 2nd May 2013 – One of the many plans is to create a big workshop for myself. I’ve cut a hole in the wall between the master bedroom and the storage room. I can now walk around the boat without having to go outside. Since they are talking about rain next week, I believe this is a good move. Aquarel – She is mine! 1st May 2013 – The owner gave me they keys of the Aquarel. She is mine!. 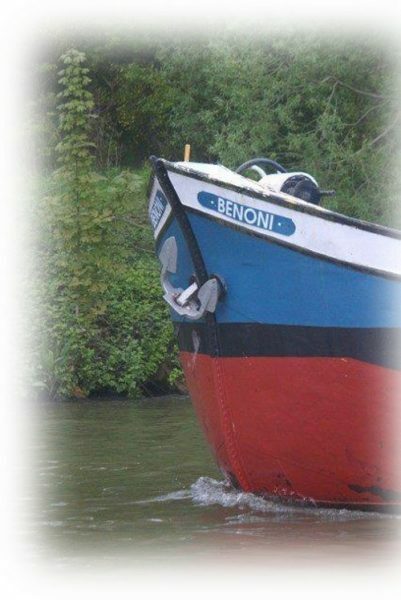 From a great happy feeling of now owning the boat, it quickly turns into a more realistic feeling: how and where to start. She is converted, but the conversion is not what I need. 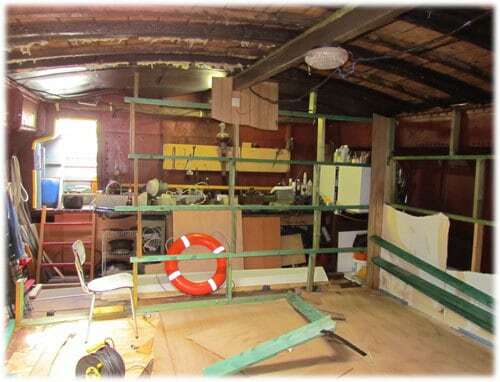 Even if I would like to have a second houseboat, she is not converted to any standard. 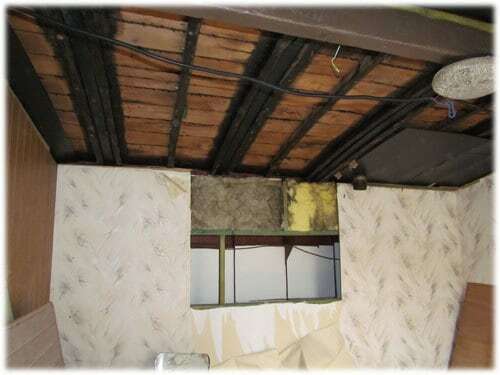 Barely any insulation, a lot of lost space, wrong materials used, humidity problems, etc..